I recently had the opportunity to talk with North Carolina bicycle accident lawyer Ann Groninger. Ann had recently written a well-received article about being buzzed on a morning ride. Or I should say, it was well-received by cyclists, all of whom have had similar experiences on the road. But some motorists had a different reaction, expressing their disdain for “scofflaw cyclists” (despite the fact that Ann had been riding lawfully, and was nearly hit by a “scofflaw driver”), or worse, expressing a thinly-veiled intent to assault cyclists with their vehicles. Before writing about her own brush with near-disaster, Ann had written another excellent article asking “Are bicycle crashes accidents?” Ann had also written aboutpersonalizing the consequences of bicycle crashes—in this case, the impact that a negligent driver had on the cyclist she hit, and on his widow. It was clear from Ann’s articles that she wants drivers to understand that, in her words, “these stories personalize the consequences of taking unnecessary risks when driving”… “what I want to talk about is the value of human life and how people can take it so lightly…by riding my bike on the road, especially alone, I am putting my life in the hands of people who don’t care about it and are willing to take pretty big risks with it.” For Ann, these stories “should be a daily wake-up call” for anyone with a conscience. So when I talked with Ann, I thought our conversation would go in that direction. But when I asked her to talk with me about a bicycling issue she was interested in, she surprised me with her answer: “kids.” Here’s what she had to say. Bob: Ann, you’ve been a North Carolina bicycle accident lawyer for some time now. Can you tell me a little bit about that? When—and why—did you start representing cyclists? Ann: Bob, the short answer to why I represent cyclists is that it allows me to combine my work and my passion! More than 10 years ago I met Peter Wilborn, who had already founded and established South Carolina Bike Law. By then I’d spent several years trying cases in the criminal court system, had left the Cumberland County Public Defender’s office and started my own practice and was doing more and more personal injury work. Peter and I hit it off and the combination of personal injury and trial experience and my love of cycling made representing cyclists a perfect fit, and North Carolina Bike Law was formed. Of course it’s now simplyBike Law. Bob: I’m glad you mentioned your love of cycling. 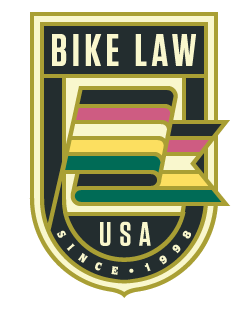 One of the things that distinguishes attorneys in the Bike Law network is that we are all cyclists. How long have you been cycling? And how did you get involved in cycling? Ann: I’ve loved bicycles my entire life. When I was a kid we would spend our whole day riding around the neighborhood. I always wanted to go further and further and loved the independence the bike gave me. My passion for riding continued into adulthood, first as a mountain biker, and then road riding. I also still use a bike for transportation almost daily. Bob: In one of your articles, you wrote “I am a mother and I have a little boy who needs me.” And when I first approached you about sitting down and talking about your bicycle advocacy interests, you said you wanted to talk about kids. Can you talk with me a little bit about that? Ann: Riding a bike was such an important part of my childhood, and I think most peoples’ childhoods. For many reasons – safety, more indoor options, more organized activities – I think it’s tougher for kids these days to just get out and ride. A lot of them will miss that unique feeling of freedom a bike gives you, which is sad. Also, young kids today are tomorrow’s drivers. If we can teach our kids respect for the road while riding their bikes they will hopefully carry that respect over to driving a car. Finally, the more people who ride, the safer cycling is for everyone. That is now a well-recognized concept. I love riding with my son and drivers are usually very respectful when I’m riding with him. But there are still many drivers who aren’t paying attention or looking for us because many times we’re the only ones traveling by bike. If more families got out and rode beyond their neighborhoods it would be more common and car drivers would know to look out for bicycles. Bob: You touched on an important point when you said that kids are tomorrow’s drivers. I think one reason to help get kids involved in cycling is because they are our future drivers, and it helps them to develop an understanding that cyclists are people just like them. It’s also a great way to help them understand their rights and responsibilities on the road. Ann: I totally agree. As I said, that understanding may have prevented a couple of crashes I’m handling right now. I also think it would breed a great tolerance, as you mentioned. The thing is, most kids love riding a bike. It’s a rite of passage to be able to ride and go places. I want to know, how do we make that available to more kids and then how do we keep that love alive? Bob: Do you have any specific cases that you want to talk about that relate to your interest in kids? Ann: I have not handled a case where I child was hit by a car. That does happen of course, but thankfully it is relatively rare. I guess I look at it as more of a big picture, as I mentioned above. If you teach kids respect for the road early on and they have an understanding of what it’s like to ride a bike, the roads will be safer for everyone. I do have a case right now where a teenage driver hit a cyclist in a bike lane. And recently spoke to another cyclist who was hit by a teenage driver in training. Both of these kids had to have seen the cyclist before they hit them. I think a better understanding on the driver’s part of what the cyclist is doing could have prevented these crashes. Also, in a lot of my cases, kids are affected because their parents are injured. So I have one client who was hit and injured pretty badly on an early morning ride a few months before his first child was born. Imagine having a new baby and not being able to physically interact the way that you want because you can’t use one of your arms? Bob: And that really brings us back to a point you’ve made in some of your articles—that these crashes that you and I deal with aren’t just hypothetical stories around which we can take sides in polarizing debates, but they involve real people dealing with the real consequences of being injured through another person’s carelessness. And as you point out, some of the people dealing with the consequences of that carelessness are children. Ann: That’s right. It’s like anything in life. If we really think through the consequences of what we do we tend to act differently. As part of my job, I often have to talk to a driver who caused a serious crash and really hurt or killed someone. Even if the driver is convinced it wasn’t his or her fault, the consequences of what happens stays with him forever. That’s because now there’s a real human connection. Let’s make that connection before and prevent these injuries and deaths in the first place. Bob: That’s such an important point you make. Imagine how much different our roads would feel if every driver felt that human connection. And maybe that’s part of the possibility of hope we both see in the next generation—that today’s kids are tomorrow’s drivers. Which brings us back to an interesting question you raised: “How do we make [riding a bike] available to more kids and then how do we keep that love alive?” There are a number of kids bicycling programs in Charlotte. Can you tell me about them? Ann: Thanks to some passionate bicycle advocates, Charlotte has some pretty cool programs. One of them is Trips for Kids. It’s actually a national and international program. The Charlotte affiliate is very strong. They have a store calledThe Re-Cyclery where people donate used bikes and parts that are fixed up and sold to raise money to provide bikes for kids. They use bikes to mentor kids and teach them how to live a healthy lifestyle and other important character lessons. Then of course the Safe Kids Coalition of Charlotte-Mecklenburg puts on bike rodeos to teach kids bicycling safety. Other organizations, shops and groups of individuals have put on events to teach kids to ride classes. Lots of charity rides have a shorter, family friendly route, races like the NoDa Grand Prix and all of the cyclocross races have a kids event. We have the annual Plaza Midwood Bike Fest, a family-friendly event with closed off streets. So there are many opportunities for kids to participate. Bob: Have you heard about Portland’s Bike Trains? Do you have anything like that happening in Charlotte? Ann: We do not have a program like this in Charlotte, but I’m putting this link into the right hands to see if it’s possible here. Bob: Are you and your son involved with any of these programs? Ann: At 5, Max is just getting old enough to understand what volunteering is and tolerate about an hour to two of it. A few weeks ago, he and I volunteered at the Re-Cyclery where we cleaned a bike together, stripped the cables, etc. Hopefully we’ll be able to make it a regular event. I think most importantly though, we ride a lot. He was single track trail riding on his balance bike at 2 so it was pretty easy for him to pick up pedaling when the time came. Now we ride wherever we can – to soccer practice, out to breakfast. Obviously it’s a different type of riding but we have constant discussions about safety – both on our end and the drivers’ we encounter. If a driver does something wrong we talk about it and I think he’s learning safe driving and respect for the road at a very early age. Bob: That’s great. I started my daughter Pepper out at a very young age as well. I taught her the rules of the road. But equally important, I taught her about how people drive, including common illegal actions, and common tell-tale indications when someone is about to drive in a way that could endanger us. By the time she could ride alone she had more street smarts than many long-time drivers. She knew the rules, but had also learned to watch cars for their intent, whether they signaled or not. So—you’re riding with your son, teaching him about safety, and participating in kids bicycling programs. What would you suggest for parents who want to get involved in kids bicycling programs in their towns? Ann: We’re really lucky in Charlotte to have a great resource – Weekly Rides – where you can find pretty much anything that is going on in cycling in this part of the State. Ask at local bikes shops and check out the programs I mentioned above. Most importantly, parents should get out and ride with their kids. I would definitely suggest the parent first take a safety course to learn the rules of the road for bicycles. I see lots of adults who aren’t used to riding not correctly communicating with traffic or understanding the risks and how to look for them. If you want your kids to ride safely, you have to learn how to do so first. Bob: That’s a great point, Ann. Any last thoughts? Ann: I really hope these programs will continue to grow in our area. There’s been talk of Kidical Mass and other open streets events being planned. I think having a bike-friendly culture adds so much to the livability of any area. It’s a gradual thing, but if we can achieve the goal of getting kids on bikes and keeping them on, we’ll get there.